It’s Sunday, I should be doing other stuff, but alas I feel like not. Went out yesterday with a good friend up from Peterborough. Wasn’t anything special couple of pints at the Kelham Island Tavern and then a trip to the Devonshire cat when my better half joined us. A few more drinks consumed, nothing much but a few Pale Riders as Jaipur was not on (damn them!). I then produced to come home when they went off clubbing , speak to the baby sitters for a little while before they went home. A brief spat on the xbox and then bed as its me who has to get up with the girls. Little did I know what was going to happen though, missus stumbles into the bedroom at 3:30, tells me the room is spinning then proceeds to spend the next 3 hours getting in and out of bed at one point she left to ‘evacuate’ her stomach into the bathroom sink, nice. Then of course my angels got up at 7:45 so that’s a grand 4 hours sleep, split into 3 hours and then just over 1. I am not tired, two cups of Typhoo! are doing a sterling job. Received delivery of my 40k Tyranid force though from this friend who transported it from the chap whos house we play. It’s now tidied away in the respective battlefoam boxes, I should paint them – but not sure. Looking online now for my 40th birthday that’s coming soon. I’m being tasked with a ‘what do you want?’ and the trouble I find is that I tend to buy myself everything I need….. anyway family stuff to do now, need to replace the leaky fishtank. An ‘idol’ for my girls when they grow up? Recently I found an article on a woman in Linux Format. That womans name was Ariel Waldman, someone of whom I’d never previously heard of. What was it about her that I took an interest in the article? Sure it had a nice picture of a nice looking woman but it had the keywords for me ‘Space’ and ‘Exploration’.previous to that. I’ve always been interested in space and recently have loved talking to my 7 year old about it where at school they’ve been learning about the planets (now that Pluto is no longer regarded as a planet). So I read it, sadly a lot of the Linux Format articles are very thin and it didn’t take too long before I’d finished it up but I had to go and view her website and read up about her, you dear reader should do likewise, i’ll save you the trouble though just click here and you’ll find her website loading in your preferred browser. She’s the creator of the website ‘SpaceHack,org‘which is a wonderful place to hide yourself for a good few hours finding out about many a project going on bringing space exploration to the average home user. She was also involved in Science Hack Day in San Francisco. It’s sad that I missed the London one back in 2010, I would be sooo interested in their being another this year please. These ‘hack’ days are places where it seems a lot of geeks arrive and make stuff. Splendid. Add some Ales to that and I’d be quite happy, oh yes throw in a pizza. Anyway Ariel is switched on, full of ideas, loves cupcakes and (to me) is a great idol for my girls for when they grow up. I’m not sure Idol is the correct word, perhaps ‘Role Model’? I do hope my girls aspire, who cares if they’re geeks, geeks can be pretty, geeky, cool and fun to be with, I know as my better half is all of that and more! Fallout 3 or OU tonight? My better half is working tonight, so once I have got my girls to bed I have the evening to myself. Now I should be doing an Open Uni assignment now that I’m finally back working and thinking but after a busy week at work my brain just doesn’t feel like it wants to do maths. I am behind on this assignment and have had my tutor contact me asking me what’s going on. Lucky for me I was away, did have that xmas tree allergy and other stuff so I got an extension. 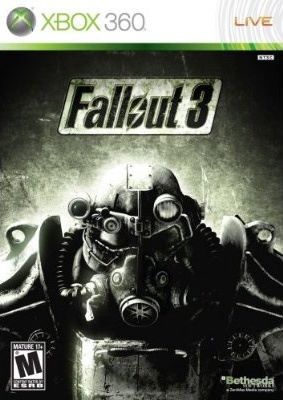 But I fancy trying out Fallout 3. I reinstalled it last night. I’ve had the game since the Game of the Year edition was released and at the same time I picked up the Official Game Guide but I just didn’t get on with it. So why try it again? First I have the investment of money, it was only £35 all in which is nothing but I don’t like having games not finished and now that I’ve completely finished Dragon Age I feel I should try. Also I have all those lovely achievements to pick up, I think I have just 4 (from when I first played) so that’s another 68(?) ready for the taking. My friends tell me it’s a feature rich game and let’s face it, Bethesda make some great RPG games, so I think I owe it to my Xbox and Fallout 3 to provide me with a nights entertainment. So wish me some luck, with a bit of luck this’ll be my game of choice and Ezio will have to wait to reveal his latest story to me. And I can convince myself that tomorrow night I can do the OU assignment…I do have until Monday! Yes it’s 18:14 (6:14pm for those who don’t understand my mind) and I’ve finished work for the day. I work from home 95% of the time, that can be hard when I have to pick up, or drop off the kids at school. Same day I do both and means a lot of my working day is also taking care of them. Anyway crap day in the office as such. Working on a Cashless card system for our flagship app and it’s being a total pain. One of our developers has written a wrapper for a library and that’s not working. Tonight I plan to work on my Java application, play some Dragon Age: Origins on my Xbox 360 and hang out with the missus. Now though I’m logging off, starving hungry so will raid the cupboards…. I’m doing an OU (Open University) module at the moment on Java (the programming language – not the coffee bean). I’ve been coding for so long nothing surprises me and Java doesn’t. Being an old skool C++ coder it’s just a step up with a lot of the niggly issues all taken care of and I like it. Of course the only reason I’m learning Java is due to my OU degree is made up from a few core Java modules and that I want to get into coding stuff for Android. I have an idea of a small desktop based app (to start) that reads in a series of folders and creates a LastFM compatible list of Artist Names and Album Titles so that I can post my music collection. I don’t know enough Java to do this without the help of Google, but I know what to do and so it’s a matter of finding out what commands to use more than anything. This is how I learnt to code though in the first place. I knew what I wanted to do (text adventure on the BBC B back in ’82) I just needed to do it…. So perhaps I will, and maybe i’ll post some code here and find out how friendly, maybe there’s also a LastFM API method that will allow to make a post without doing anything? Seems that with their 4 decades of life I’ve lived I have a lot of memories. These memories are still sitting in my head so the idea behind this blog is to perhaps immortalise some of them, in a world where data is stored in ‘clouds’ it would seem this data could well live on beyond myself. I’m new to this blogging stuff (did have a small blog before on a friends server) and I know very little of wordpress beyond its popularity. I own domains, so I could have placed this onto one of them. I chose not to as I couldn’t be bothered to go through any installation and/or configuration. It’s all quite at home now, my better half and our two children are away visiting a local friend and so for the next 90 minutes I will try and enjoy the piece and quiet.